Pyrite is an iron sulfide, with the chemical formula FeS2. Gold's chemical formula is simply Au. 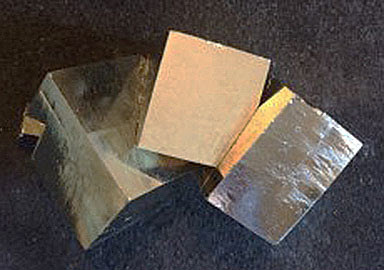 Pyrite crystal system is isometric (cubic), and crystals formed under perfect conditions will be cubes (as shown below). Gold is rarely found as crystals; rather, it occurs in nuggets, irregular blobs, or small flakes. It cannot occur in cubes. 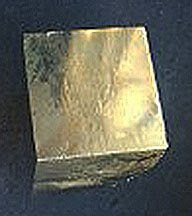 Single cube of pyrite, width 2.9 cm (from Spain). Cluster of intergrown pyrite cubes, total width 5 cm long (from Spain). Pyrite is harder with a value of 6.5 on the Moh's Hardness Scale [i.e., a scale with talc and graphite the softest minerals (value of 1), and with diamond the hardest mineral (value of 10). Gold has a value of 2.5. Gold is very soft; so much so that other elements (e.g., copper, nickel, or platinum) have to be added to it (in the form of an alloy) in order to make jewelry. Note: An ordinary steel knife (hardness value of 4.5) cannot scratch pyrite but can easily scar gold. The superior hardness and brittleness of pyrite also cause it to smash into bits if struck with the tip of a high-quality knife or shatter into small pieces, if hit with a hammer. Pyrite's streak (its powdered from when scratched across an unglazed porcelain plate, called a streak plate), is black. Gold's streak is brassy yellow. Small irregular piece of pyrite with its characteristic black streak on a "streak plate. Pyrite is less dense, and small flakes normally wash away when placed under running water. Gold flakes are very dense and will sink. This is why "gold panning" works so well for finding gold.